Greece's public broadcaster doesn’t officially exist, but ERT3's news bulletin, which covers social issues and movements, continues to go out every night. The ERT3 news bulletin goes out from their studio in Thessaloniki at 10 p.m. every night. For around an hour, news from Greece, Europe and the world are covered. The anchor fields live interviews, both in the studio and over the phone or Skype. It’s just like any other major news channel, anywhere in the world, except for one significant detail: ERT doesn’t officially exist. ERT was shut down by the Greek government on June 11 last year. An announcement was made accusing the Greek public broadcaster of corruption and wastefulness; the signal was cut before midnight, leaving all screens tuned to ERT black. When ERT’s headquarters in Athens — whose occupation Waging Nonviolence covered last year — was raided and emptied in November 2013, defiant journalists were forced to make their last broadcast surrounded by police. The international news cycle had long moved on by that point. The ERT3 office, sitting on a street corner not far from Thessaloniki’s city center, is quiet now. The crowds that had been milling about outside the building this time last year have disappeared. A few banners and spray-painted graffiti provide the only evidence that they were ever there at all. One could be forgiven for thinking that the ERT3 occupation has also come to an end. But inside the building technicians and journalists plug away at their desks, making sure there is live programming every day: six hours for television and eight hours for radio. Reruns and archival material are broadcast for the rest of the time, keeping the feed going 24/7. The office lobby features a big collage of photographs, preserving the memories of the past year’s struggle. Eleftheria Farantaki — who used to be in charge of television graphics and social media, but now does a bit of everything — estimates there to be about 30 people working in television and 25 in radio. They sometimes also have supporters and volunteers help them with their reportage and programming. Despite what happened to their Athenian counterparts, ERT3 is still broadcasting. It’s tough, but the workers are coping. After almost 14 months of struggling it looks as if the ERT3 team have found their feet again; they all seem more relaxed and confident than they did when I first met them a year ago. “There is a machine that works,” said journalist Christina Siganidou. People are now more settled and clear about their roles within the group. Farantaki beckoned me to her workstation when we walk into ERT3 on Monday evening. Raw, handheld video footage is playing on one of her computer monitors, showing a small group of women protesting outside a vast construction site. Some of the women have chained themselves to the fences. “Did any other media cover this?” I asked. The protest was included in ERT3’s bulletin that night. It’s a perfect example of the coverage that the channel now provides: news of movements and protests that might not make it into media reports elsewhere. 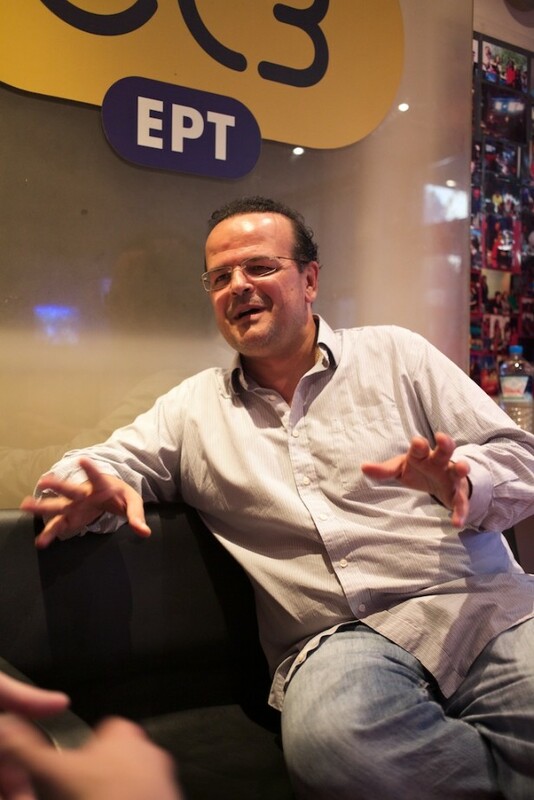 “The most valuable thing is to give voice to the movements,” said Siganidou, who presents the nightly bulletins. On top of the Skouries issue, ERT3 has covered a host of other Greek social issues, such as water privatization and the mass layoffs of public sector cleaners and school guards. This new focus — combined with the fact that they are now mainly broadcasting online — has brought about a complete change in audience demographics. What used to be a viewership of elderly, conservative Greeks has now been replaced by a younger Internet-savvy anti-government crowd. Alexandros Triantafillidis, who presents a weekly political talk show, said he never used social media until the shutdown. Now he receives comments over Facebook, Twitter and YouTube cheering him on. Siganidou believes that ERT3 still has the support of older folks, recounting her experience with an old lady urging her to collect petition signatures outside churches. The challenge for ERT3 now is how to harness this support and decide on their next step. No longer relying on government decisions, the remaining ERT3 staff have to figure out what they want to do — continue with the occupation until they are removed from the building like their colleagues in the capital, or begin to explore new ways of establishing themselves? The answer to that question is not yet clear. Meetings between staff and their supporters are still being held in the hopes of thrashing out a solution. People are racking their brains to think of ways to attract more international attention and support. The possibility of the government seizing the building still hangs over everyone’s heads. Times are uncertain, but also full of possibilities. When asked about the future, Siganidou shrugged her shoulders and smiled. She then became serious: “Excuse me, I have to rush to prepare my bulletin now.” And the ERT3 pirate broadcast rolls on for another day.